ZZ Holy Cross/St. Michael Catholic Elem. The North side is the original residential area of Sioux City. It is broken into several neighborhoods. The southern portion of the North side is characterized by large estate homes in the Craftsman, Colonial and Victorian styles. The northern section contains the Indian Hills area homes built between the 1960’s and 1980’s, the Country Club area, which includes sprawling ranch homes from the 1940’s to 1980’s, and Leeds which has a variety of homes ranging in age and style. Morningside was originally a streetcar suburb in the late 19th century. Today it is a large sprawling area of Sioux City containing numerous distinctive neighborhoods. As a whole, Morningside is a mix of older residential neighborhoods and commercial corridors. Peters Park is the historical commercial center of Morningside, while the Southern Hills area includes the Southern Hills Mall, Lakeport Commons and Singing Hills area. 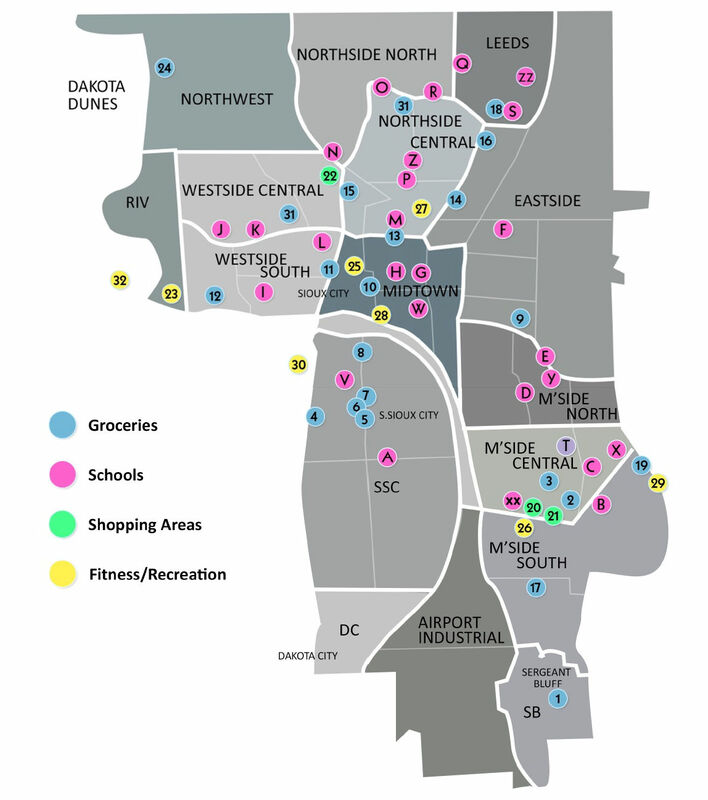 The West Side is a mix of low-income and middle-class residential neighborhoods. On this side of town, there is Riverside, a flat, bluecollar residential area on the west side of Sioux City, along the banks and floodplain of the Big Sioux River. Smith-Villa and Prospect Hill, located on the lower west side of Sioux City is one of the city’s oldest residential neighborhoods. Singing Hills is the commercial area including the Southern Hills Mall and Lakeport Commons shopping areas found in the Morningside area. Automotive dealers, restaurants, groceries, big box stores and banks can all be found in this area. The Grayhawk Ridge neighborhood with middle income to upper income housing is also in this area. Downtown is the main business district. It extends from the Riverfront up to about 8th Street. The Courthouse is on the National Register of Historic Places and is a National Historic Landmark. Also located downtown is the Orpheum Theater, built in 1927. The Orpheum was renovated in 2001 and has since hosted Broadway shows, international musical performers, and on special occasions, the Sioux City Symphony Orchestra. The Tyson Events Center is located near the riverfront, and is a 10,000-seat venue for conventions, entertainment, and sports events; it is the home of the Sioux City Musketeers, a team affiliated with the United States Hockey League – an amateur hockey league. Historic Fourth Street (also called “Lower Fourth Street”) is a district on the east side of the main downtown area that is enjoying a renaissance. This area includes many local eateries, as well as a movie theater, the Sioux City Convention Center, and condominiums above some of the businesses. Hamilton Blvd separates the downtown and North side areas from the West side of Sioux City. This area is home to auto parts stores, restaurants, banks, specialty stores and big box stores. Dakota Dunes, South Dakota borders upon Sioux City along the Big Sioux River. It is a 2,000 acre, master-planned community started in 1988. The area has primarily white collar housing ranging is sizes and values up to several million dollars. The area features the country club golf course designed by Arnold Palmer. McCook Lake is a natural oxbow lake found about one mile north of North Sioux City and the Dakota Dunes. It was formed from a “cutoff” of the Missouri River. Now it is a residential area with both smaller ranch style homes from the 1940’s-1960’s and newer, larger lake homes. It is home to Dakota Valley Schools where students from the Dakota Dunes, McCook Lake and most of Wynstone attend. The concept of Wynstone was developed in 1995. Gateway was growing rapidly at the time. The investors saw a need for an alternative to The Dunes. They envisioned a place with larger lots and much more open space but with the security of a gated community. Located approximately one mile to the West of McCook Lake, all of the homes in this community are larger, white-collar homes. This area is highlighted by contemporary ranch, two-story and multilevel homes. Sgt. Bluff is a suburb of Sioux City. Just south of town along interstate I-29, this town houses the 185th Airguard Refueling Wing. Old town Sgt. Bluff has many four-square and small ranch homes, while the newer additions, begun in the 1970’s and still building today range in styles from Ranch to Split Level to Multi-level and Two story homes. South Sioux City, NE abuts Sioux City, IA just across the Missouri River to the South. The city is home to approximately 13,000 people and has neighborhoods for all different income levels.